The BESIII detector finished accumulating a sample of 10 billion J/ψ events together with a continuum data sample on Feb. 11. The 10 billion J/ψ-event sample accumulated at BESIII is the world's largest data sample produced directly from electron-positron annihilations. The J/ψ particle is a charmonium state composed of a charm and an anticharm quark; it was discovered in 1974 by groups led by Samuel Ting and Burton Richter. Its high production rate in electron-positron collisions and very large radiative decay rate make it a perfect laboratory for studying exotic hadrons composed of light quarks and gluons, which are the keys to understanding the nature of the strong interaction. 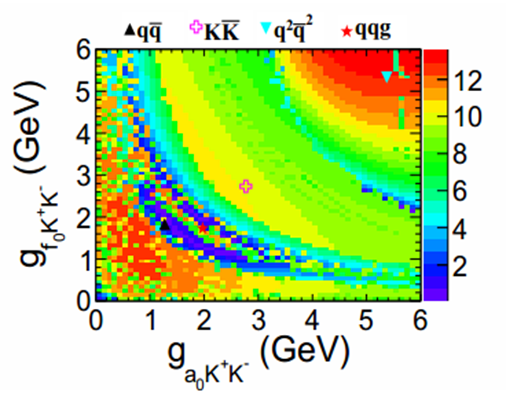 The study of exotic hadrons, including those composed of pure gluons (glueball), both quark and gluons (hybrid), or more than three quarks (multiquark state), is one of the most important goals of the BESIII experiment. With 1.3 billion J/ψ events collected in 2009 and 2012, BESIII has reported many such studies. Together with the new J/ψ data sample collected since 2018, the 10 billion J/ψ-event data sample makes all these measurements in much improved precision and the searches for new processes in much improved sensitivity possible. The BESIII detector is a magnetic spectrometer at the upgraded BEPCII (Beijing Electron and Positron Collider) that operates in the τ-charm threshold energy region. BESIII has been successfully operating since 2008 with a rich physics program to understand strong, electromagnetic, and weak interactions. During this round of data acquisition, the peak luminosity of BEPCII reached 4.7*1032 cm-2s-1, which is about 100 times higher than that of BEPC, the previous version of the collider. With the unique advantage of an unprecedented high-statistics J/ψ sample, BESIII will continue to play a leading role in research for new forms of hadronic matter in the high-precision frontier.